You'll be £12.99 closer to your next £10.00 credit when you purchase More Foul Deeds and Suspicious Deaths in Birmingham. What's this? The volume starts with the mysterious murder of Mary Ashford in 1817 and follows a trail of mayhem through the Victorian and Edwardian eras to the controversial execution of the young James Farrell in 1949. These accounts of our past are drawn from contemporary newspapers and periodicals, reflecting the way our attitudes to different crimes and punishments have changed over the years. The long debate about capital punishment is brought into focus by the public reaction to each new death sentence. Unlike the first volume, almost every case examined concludes on the scaffold. The stories encompass jealousy, lust, anger and greed - some things just never change. The city itself gradually grew from the green fields of Erdington that Mary Ashford knew, to the grim warrens of back-to-backs that housed Harry Jones and other ne•er-do-wells, but underneath normal city life there has always been those few crazed characters ready to explode into a lethal frenzy. They have carved themselves a place in local history, usually with a wickedly sharp knife. Here too are the vicious thugs whose violent robberies left widows and orphans in their wake, whether in 1830s or 1930s. This book is perfect for fans of true crime, whether they be from the Birmingham area or not. Of course, those from the West Midlands will benefit more from its regular mention of places the reader will likely recognise, but it is by no means necessary for enjoyment. I recommend this to everyone. A highly enjoyable, well-researched, well-written piece of work. 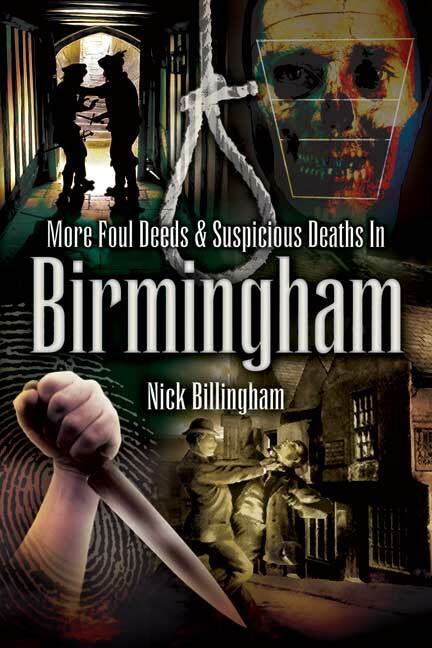 A gripping exploration of the darker sides of Birmingham and the Black Country in the 19th and early 20th Centuries, as seen through 27 notorious murders which were carried out between 1817 and 1948, almost all of which culminated in the death penalty, with the final case marking the last execution carried out at Winson Green Prison. Each are described in sometimes as little as five pages, yet despite these seemingly narrow constraints, Nick Billingham vividly sets the scene and carefully describes all the known facts about each case. Helped along by eyewitness accounts, newspaper reports and photographs, this is not just a fascinating study of crime in the Birmingham area, but the circumstantial detail also provides an insight into typical daily life during these times, and so is useful in a wider social history context.